HOME (English) | YOKOI MANUFACTURING LTD.
After natural disasters such as typhoons and earthquakes,rescuers face many challenges. 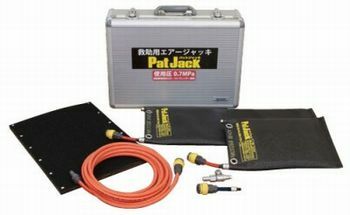 Pat Jack has been developed after many experiments to solve one of the greatest challenges,that of raising masonry or building materials to free victims of the disaster. The Pat Jack is perfect for emergency situations,light weight,portable,simple inflation and most importantly it is safe. Copyright © YOKOI MANUFACTURING LTD. All rights reserved.